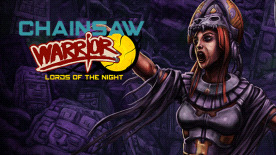 Chainsaw Warrior: Lords of the Night sees the player fighting against hordes of Aztec Zombies, and the clock, to save reality from Darkness. Lords of the Night introduces an upgraded combat system, new weapons, powers, equipment, and unique mini bosses that require careful tactics to defeat. It adds three new zones to fight through, an even tougher confrontation with the enigmatic Darkness and plenty of new opportunities to die! It's the year 2035 and the crazed followers of a near-forgotten God have opened a hole into a nightmare dimension. Through this portal bizarre and dangerous creatures are flooding into our world, intent on total destruction! There remains just a single hope: a shadowy ex-special forces soldier, enhanced for combat and known only as 'Chainsaw Warrior'. He saved New York in 2032 - can he now save the world? Equipped with new high-tech armaments, he must battle his way through the jungle to find and defeat Darkness. Not only are there swarms of Aztec zombies, mutants, traps, Moon Cult Agents, and other twisted fiends between him and Darkness, time is the enemy too! Only 60 minutes remain to save us all before we are torn from our reality forever. Chainsaw Warrior was first published as a solo board game in 1987, and is expanded in this new adventure. An epic battle that offers new gameplay, weapons, equipment, enemies and much more. Can you prevail where all others have failed? You only have 60 minutes to save the world!